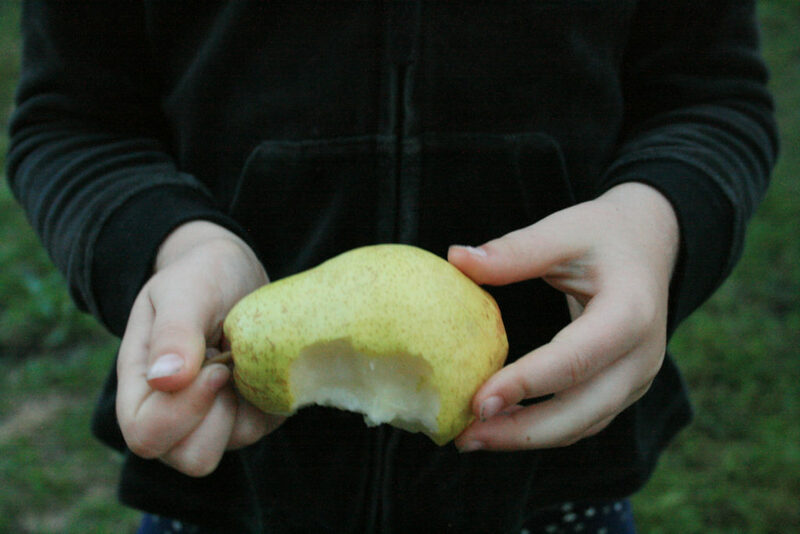 This is an exciting year for us at our little budding homestead, not only because of the addition of bees, and a baby, but because the pear tree turned five and is now producing a decent show of pears. (Whether they are for us to enjoy, or the squirels is still up for debate, but we’re excited either way!) This tree is mighty special. It has been our first foray into fruit trees and also placentas. Yes, I said placentas. There’s a couple under there, but I’ll spare you that particular photo. It was about this time of year that my eldest sat near, a little unsteady as she was, while I dug a massive hole in the lawn (barefoot? 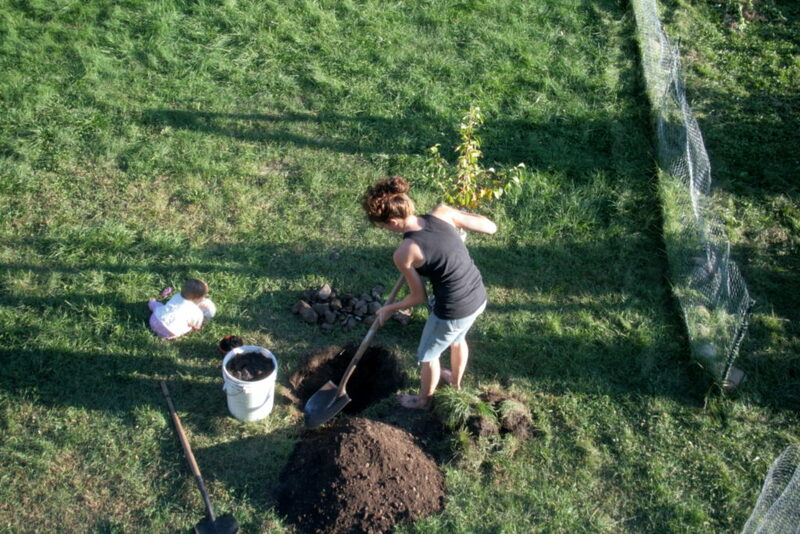 I guess…), pulled out a slew of rocks, as always, and amended the soil that was to nourish the wee tree (insert a bucket of compost and two healthy home birth placentas). Oh our naked yard needed it so desperately, as did the hot, unshaded house, and my ravenous appetite for learning all things food-production. Do you see that little tree behind my right shoulder? So small! It has been a true wonder to watch that turn into this! As you can see, a greenhouse/chicken coop was added to that spot, too. 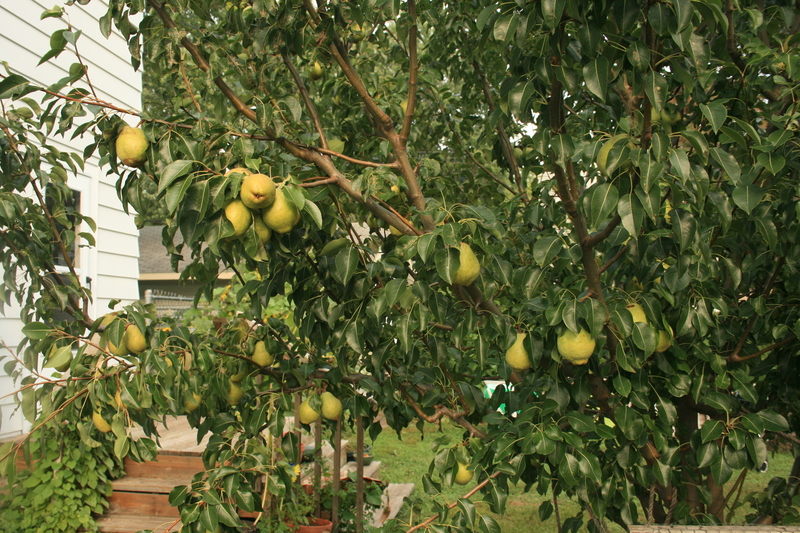 As you can also see, there are only a couple pears on this side of the tree. Yep, the bulk of them are on the other side, quite ununiform. The story of this tree after its powerful planting is a little less magical. Not knowing much about fruit tree care, I did not train it or prune it for a few years. Then noticing it was blemished with leaf spot and growing straight for the sky in such an odd shape, I did attempt to pull out on the outer ring of branches from the main stem. Well, this worked a little, though it would have been better to do it years prior. One branch hangs lower than the rest – I tugged a little hard and caused a scar in the flesh of the branch. Interestingly enough, though, that branch produces the most fruit! While I do recommend you plant a fruit-bearing tree the next time you have the opportunity, please be more informed as to training and pruning than I was! Just when I was feeling a tad sad that the tree isn’t a bit prettier for me to show you all, I realized the misshapen tree is a direct reflection of myself, and how suiting. The pear tree began its life about the time that I began my parenting journey. This disheveled tree speaks to that – these last five years have been some hard years, and I’m not just comparing them to some cozy joy ride. Without sharing all the nitty gritty in this post, I’ll just say they’ve been damn hard. No wonder I haven’t kept a magazine-worthy pear tree! Suddenly, the misshapen pear tree brought me a little comfort as I saw myself in the tree. Disheveled, uneven, and dare I say, jaded, but still marching on and even producing some fruit. We can all learn a lesson or find some wisdom now and then from our garden and the things that we grow, if we will slow enough to see and hear. Those kids, they remind me to slow enough to see and hear. Today, R sat with a friend under that very tree, munching on pears and reading books. 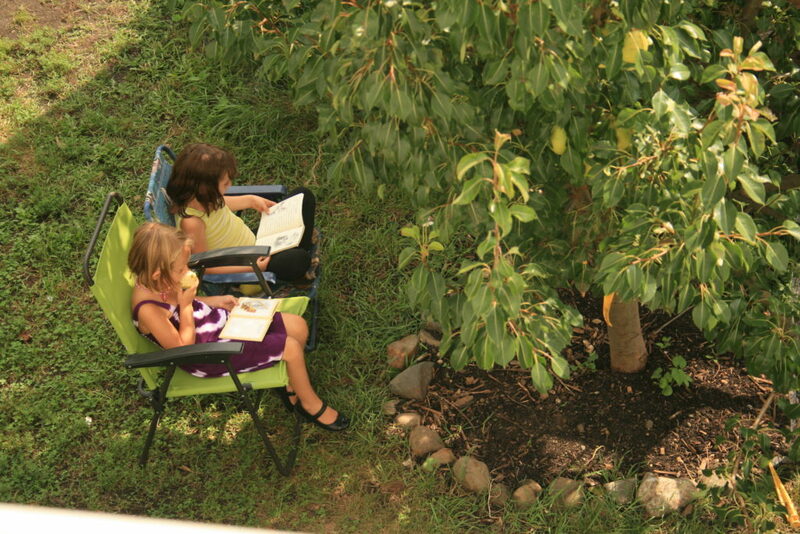 On these perfect (still) summer days, I hope we can all set aside the time to do the same. I welcome you to share a lesson that your garden has taught you, or a realization it has given you. 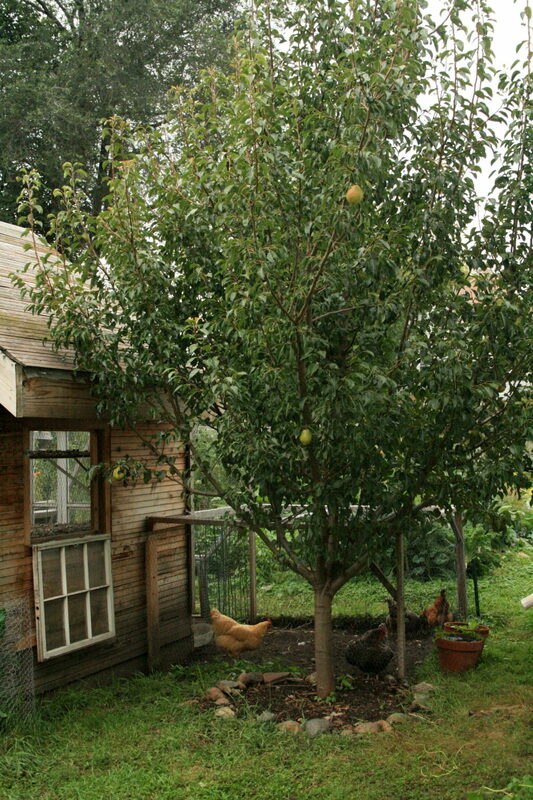 Or simply share what fruit trees you are growing! I love to hear from you all!